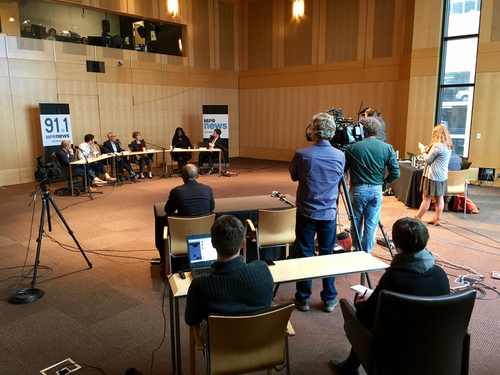 Five of the leading candidates running to be mayor of Minneapolis meet for a two-hour debate on their vision for the city with MPR News host Tom Weber. Comment here on the live blog or use #mplsmayor on Twitter to join the conversation. Minneapolis Mayoral Debate with MPR News host Tom Weber. What question do you have for the candidates? Sixteen candidates are on the ballot for Minneapolis mayor this year. 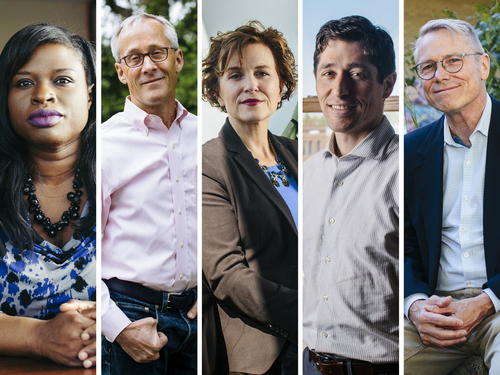 Here's a look at five of the people in the running that will join MPR News' Tom Weber for a debate about the future of the city..
Tell MPR News: What question do you have for the candidates? Good morning. Today, we have the five leading candidates for Minneapolis mayor in the MPR studios for a debate moderated by Tom Weber. This debate will be conversational in tone — there won't be any clocks ticking down, or buzzers cutting off the candidates. The candidates we're hosting are those who have raised at least $10,000 in outside contributions for the 2017 reporting period. They are Raymond Dehn, Jacob Frey, Tom Hoch, Betsy Hodges and Nekima Levy-Pounds. For the entire list of candidates and their profiles, read our campaign snapshot. We'll discuss a range of issues facing the city, including policing and public safety, racial inequity, public housing and gentrification, and each candidate's vision for the mayor's office. We have our own questions, and some submitted by the audience. I'll be live-blogging the whole thing right here. Stream the entire debate on our Facebook page or our website. We'll put it on the Tom Weber podcast later, too. Good morning everyone, thanks for joining us. The debate will get underway just after the newscast. Question about voting? Visit the Minnesota Secretary of State's website. Sixteen candidates are on the ballot this year for Minneapolis mayor. Several sought the DFL endorsement but the party could not pick a candidate. How do we boost affordable housing? It's no longer possible for younger people to build a life in Minneapolis, says Susan, who called in with a question for the candidates. Here's what the candidates had to say regarding housing in Minneapolis and how to get more affordable places to live in the city. • Jacob Frey: Frey says Minneapolis needs to build deeper affordable housing. To pay for city subsidies of affordable housing developments, Frey wants to use the value capture model. He cited his experience representing Ward 3 on the city council, which he says has recently accounted for nearly half of all new residential housing in Minneapolis. • Tom Hoch: Hoch quickly cited high property taxes in the city as a primary issue relating to affordable housing. He says Minneapolis not being sensitive to its property taxes can make affordable housing into unaffordable housing. He also said it's important that the housing authority have the resources it needs. • Betsy Hodges: Hodges noted that she's facilitated housing discussions with regional leaders so the focus isn't all on Minneapolis. She also said it's important to emphasize preservation of affordable housing that already exists, as it's cheaper than building new units. Hodges also noted her administration has been monitoring the affordable housing situation and that she wants to address high eviction rates. • Nekima Levy-Pounds: Levy-Pounds says there's a "crisis" of housing in the city. There are 17,000 people on the public housing waiting list, and more focus on them is needed, she said. Current policy doesn't have a viable solution to address this, she says. Levy-Pounds said the poor and working poor don't have a voice in City Hall, but she could offer one. She suggested changing city zoning code to allow for more multi-family dwellings. • Raymond Dehn: Dehn says the rental market is "out of control." Renters are more than half of Minneapolis' population, he says, and the city needs to step in to tackle major rent increases. He suggested rent stabilizaiton measures and penalizing "predatory" landlords. He cited his experience securing money for affordable housing in the state Legislature. The private sector can't solve housing problems, he said. Talking policing, Nekima Levy-Pounds says she doesn't have faith in any of the other candidates at today's debate to address what she called a history of "chronic abuse" by the Minneapolis police department. Raymond Dehn says many police act as if they're working in "war zones." That makes for an environment where people fear the police, and police fear the community, he says. He suggested a more "compassionate" way of policing, which could involve bringing in different people to become officers. "Community policing needs to be more than just a catchphrase," says Jacob Frey. But now, he says, officers are just "running from 911 call to 911 call" and don't have time to actually engage with the communities they serve. He says the city needs to restore trust in police, and that Minneapolis needs more officers of color. We will be right back in 5 minutes for the 2nd hour of the debate. • Raymond Dehn: Choose the candidates who align with you. • Jacob Frey: I don't have a second or third choice. • Tom Hoch: Vote your conscience. • Betsy Hodges: No other choice, but I have appreciated the conduct of Raymond Dehn and Nekima Levy-Pounds during the campaign. • Nekima Levy-Pounds: Consider the research you've done on candidates and vote with your conscience. We're talking education now. Betsy Hodges, up first, notes that educational disparities start right away. That's why she started her "cradle to K" agenda, which aims to get kids resources they need right when they're born. Nekima Levy-Pounds says the mayor needs to use the bully pulpit to push against racist curriculum, and to advocate for teachers, parents and students who want to shift away from the status quo. Raymond Dehn says the mayor needs to work with all agencies that have an impact on children's lives — including the city's park and recreation board as well as faith leaders. Jacob Frey says the city should focus more on vocational training. "You can start teaching a 5-year-old to code" and they'll be on a path to a living-wage job after high school, he said. Tom Hoch says Minneapolis needs to change the pattern of parents sending their children outside the city's public school system. He also suggested leveraging the city's arts community, saying that involvement with the arts makes students more likely to be successful. Talking climate change, Nekima Levy-Pounds says Minneapolis needs to put more resources into educating citizens on energy efficiency. She also wants more city investment in energy-efficient vehicles and to offer incentives to businesses to install solar panels. Raymond Dehn offered a specific proposal to change city code: By 2025, 75 percent of all new buildings in Minneapolis must meet net zero standards. Betsy Hodges notes a clean-energy partnership with utility companies during her time as mayor, which allows her administration to discuss goals for renewables with energy sector leaders. Do you support Barb Johnson continuing as City Council president? • Jacob Frey: While Frey says he respects Johnson, he thinks it's time for a new president. • Tom Hoch The council should decide, he said, but the mayor needs to work with whoever is in office. • Betsy Hodges: The council should decide its leader, she says, and the mayor needs to work with them. • Nekima Levy-Pounds: She wants new leadership, but says she would work with whoever is in office. • Raymond Dehn: He says it isn't the mayor's job to get involved with council posts — the mayor just needs to work with council members. Polling places in Minneapolis are open from 7 a.m. until 8 p.m. Thanks for tuning into our Minneapolis debate. The five candidates — Raymond Dehn, Jacob Frey, Tom Hoch, Betsy Hodges and Nekima Levy-Pounds — focused on policing reform, affordable housing and equity. • Frey: Frey says Minneapolis needs to build deeper affordable housing. To pay for city subsidies of affordable housing developments, Frey wants to use the value capture model. He cited his experience representing Ward 3 on the city council, which he says has recently accounted for nearly half of all new residential housing in Minneapolis. • Hoch: Hoch quickly cited high property taxes in the city as a primary issue relating to affordable housing. He says Minneapolis not being sensitive to its property taxes can make affordable housing into unaffordable housing. He also said it's important that the housing authority have the resources it needs. • Hodges: Hodges noted that she's facilitated housing discussions with regional leaders so the focus isn't all on Minneapolis. She also said it's important to emphasize preservation of affordable housing that already exists, as it's cheaper than building new units. Hodges also noted her administration has been monitoring the affordable housing situation and that she wants to address high eviction rates. • Levy-Pounds: Levy-Pounds says there's a "crisis" of housing in the city. There are 17,000 people on the public housing waiting list, and more focus on them is needed, she said. Current policy doesn't have a viable solution to address this, she says. Levy-Pounds said the poor and working poor don't have a voice in City Hall, but she could offer one. She suggested changing city zoning code to allow for more multi-family dwellings. • Dehn: Dehn says the rental market is "out of control." Renters are more than half of Minneapolis' population, he says, and the city needs to step in to tackle major rent increases. He suggested rent stabilizaiton measures and penalizing "predatory" landlords. He cited his experience securing money for affordable housing in the state Legislature. The private sector can't solve housing problems, he said.